TUNIS, Tunisia - Tunisia's prime minister announced a national unity government Monday, allowing opposition into the country's leadership for the first time in a bid to quell civil unrest following the ouster of President Zine El Abidine Ben Ali amid huge street protests. However, at least one union leader said the changes were not enough and predicted demonstrations would continue until all key figures in the old regime had been swept from power. Tunisia's government said more than 78 protesters and other civilians have died in the protests, which have swept the country for a month. Interior Minister Ahmed Friaa said 94 civilians have been injured. And he said members of security forces also have been killed, but he did not say how many. Although Ben Ali fled the country on Friday, after 23 years in power, members of his government will play prominent roles in the new unity government. Prime Minister Mohamed Ghannouchi, a longtime ally of Ben Ali, and several top ministers have retained their posts. Ghannouchi, who has been premier since 1999, said the current ministers of defense, interior and foreign affairs would also keep their posts. He announced as well that political prisoners would be freed, as one of an array of measures aimed at loosening up a political system that for decades was effectively under one-party rule. But a critical question was whether the changes in the government lineup would be enough to stabilize the North African country, which has been reeling under from the unrest. Friaa told reporters Monday that 85 police stations had been damaged, along with 13 town halls, 43 banks, 11 factories and 66 stores or shopping centers. He said the country's economy the Tunisian economy lost 3 billion dinars (US$2 billion) amid the troubles. A union leader upset at the prospect of a government full of old guard ministers, predicted growing demonstrations to press for an end to power positions for the RCD - Ben Ali's political party. "It (RCD) left by the back door and is coming back through the window," said Habib Jerjir, member of the executive bureau of the Regional Workers' Union of Tunis. "We can't have militias in the streets and in the government. Many opponents of Ben Ali's rule had taken to the streets to express their hope the new government would not include of remnants of his iron-fisted regime. In addition to the holdovers, three opposition figures - including Nejib Chebbi, a founder of the opposition PDP party - will take up posts in the government. Until new presidential elections are held, the country is being run by interim president Fouad Mebazaa, former speaker of the lower house of parliament, also a veteran of Tunisia's ruling party. Ghannouchi said all non-governmental associations that seek it would be automatically recognized, and all the restrictions on the Tunisian League for the Defense of Human Rights would be lifted. Earlier Monday, security forces fired tear gas to repel angry demonstrators. Later, a small, peaceful group of youths carried signs reading "GET OUT" - marching under the gaze of police, some of hundreds of security forces deployed in the capital. Ghannouchi said the government would create three new state commissions to study political reform, investigate corruption and bribery, and examine abuses during the recent upheaval. Ghannouchi didn't refer to the prospect of new elections, which under Tunisia's constitution must be called within 60 days. But some members of the opposition want more time, to allow the public to get know the choices in a country known for one-party rule. "The RCD still holds the power," said Hedi Guazaouni, 29. With the potential for change after Ben Ali's flight from the country Friday, "This is a chance not to be missed," he said. Hylel Belhassen, a 51-year-old insurance salesman, summing up the concerns of some, saying: "We're afraid that the president has left, but the powers-that-be remain. We're afraid of being manipulated." Demands for change were being made across sectors reined in by the Ben Ali regime's grip. Journalists at the nation's oldest state-run paper, La Presse, rose up in revolt Monday and dismissed the editor-in-chief, Gawhar Chatty. The paper, which daily featured front-page photos of Ben Ali or his wife, is now to be run by a committee of journalists until a new direction is appointed. They advised Chatty by phone that he was no longer welcome but he came to work anyway. The noted cartoonist Lotfi Ben Sassi marched into his office. "We can no longer allow you to continue with this editorial line," Lotfi said, under the eye of an Associated Press Television News camera. "We are journalists." Asked later if he restricted reporting, Chatty conceded, "Yes, it's clear. Yes, there was censorship." The European Union said Monday it stood ready to offer economic aid and help Tunisia become a democracy. Finance Minister Christine Lagarde of France - a former colonial overseer of Tunisia - told French radio Monday that Paris is keeping a close watch on the assets of Tunisians in French banks. During a visit to neighboring Algeria on Monday, U.S. President Barack Obama's top counterterrorism official, John Brennan, said the United States was ready to help the Tunisian government in holding "free and fair elections in the near future that reflect the true will and aspirations" of Tunisians. Moncef Marzouki, a professor of medicine who leads the once-banned CPR party from exile in France where he has lived for the last 20 years, told France-Info radio he would be a candidate in the presidential election. "The question is whether there will be or won't be free and fair elections," said Marzouki, whose movement is of the secular left. Whatever emerges, the new leadership will first face the challenge of restoring order. Looting, gunbattles, and score-settling have roiled the country since Friday, when a month of street protests against years of repression, corruption and a lack of jobs brought down Ben Ali. The family of a French photojournalist said Monday he had died after having been hit in the face Friday with a tear gas canister. The French Foreign Ministry said Loucas Von Zabiensky-Mebrouk, 32, was the "victim of a deliberate homicidal act." The victim, who often used the name Lucas Dolega, worked for the EPA photo agency. 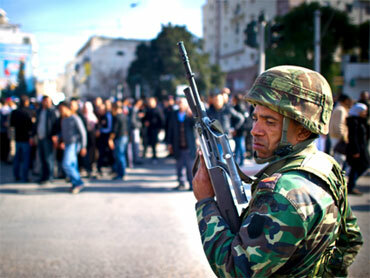 Shops in the center of Tunis remained shuttered Monday, and police were deployed in force. A semblance of normal daily life returned in other areas of the capital where shops, gas stations, pharmacies and supermarkets reopened. Many people returned to their jobs and others rushed to buy scarce stables like bread, fish and milk. Hundreds of stranded tourists were still being evacuated from the country, and foreign airlines gradually resumed the flights that were halted when Tunisian airspace closed amid the upheaval. Over the weekend, police arrested dozens of people, including the top presidential security chief, as tensions appeared to mount between Tunisians buoyant over Ben Ali's ouster and loyalists in danger of losing many perks. Ex-presidential security chief Ali Seriati and his deputy were charged with a plot against state security, aggressive acts and for "provoking disorder, murder and pillaging," the TAP state news agency reported. Fierce gunbattles broke out between the two groups around the presidential palace Sunday in Carthage on the Mediterranean shore, north of Tunis and near the Interior Ministry in the capital. The protests began last month after an educated but jobless 26-year-old set himself on fire when police confiscated the fruits and vegetables he was selling without a permit. His desperate act - from which he later died - hit a nerve, sparked copycat suicides and focused anger against the regime into a widespread revolt. Reports of self-immollations surfaced in Egypt, Mauritania and Algeria on Monday, in apparent imitation of the Tunisian events. The downfall of the 74-year-old Ben Ali, who had taken power in a bloodless coup in 1987, served as a warning to other autocratic leaders in the Arab world. His Mediterranean nation, an ally in the U.S. fight against terrorism and a popular tourist destination known for its wide beaches, deserts and ancient ruins, had seemed more stable than many in the region.